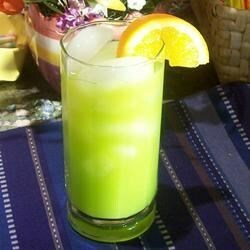 "A sweet and refreshing cocktail made with orange juice and melon liqueur. Fruit garnish is optional." Fill a tall glass with ice. Pour in the orange juice followed by the melon liqueur. Stir. Watch a professional bartender shake up a signature mezcal cocktail. Very tasty drink and so easy to make! I really liked it as is, but I think it would be great with a little fizz, maybe some gingerale. Thanks.